That brings me to the recipe I am sharing with you today. 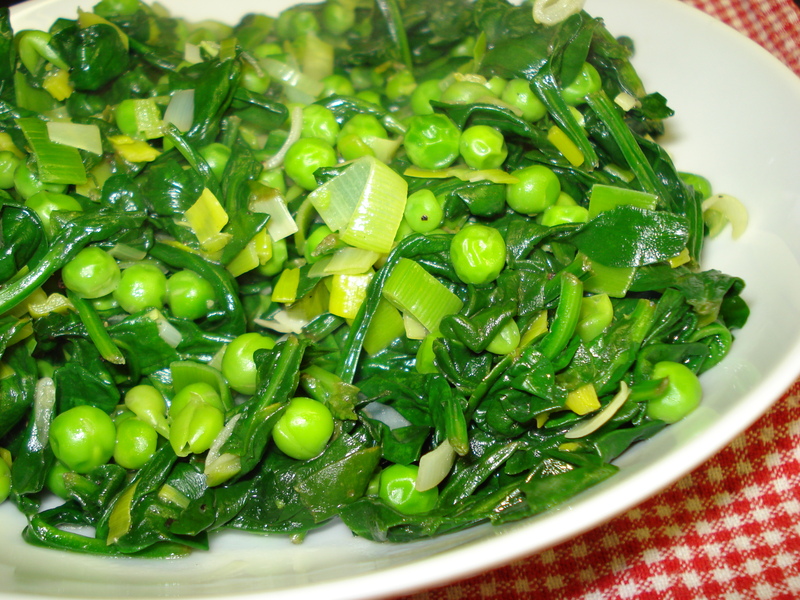 While watching Fifteen Minute Meals, Jamie Oliver created a fantastic side dish of braised spinach, leeks and peas. It looked so bright and delicious, that I immediately went to our tablet to see if I could *find the recipe on-line. I was quite happy when I discovered the recipe on-line. It is appealing in its simplicity – just three green vegetables and a bit of olive oil, all seasoned with salt and pepper. Could a side dish really be this simple? Well, I made it my quest to find out. The instructions were very straight-forward, heat up your olive oil, sauté the sliced leeks, wilt the spinach and heat the peas through. Once you have completed all these steps, season your dish with salt and pepper and serve. I could not believe how absolutely delicious this dish was. It was such a colourful contrast to our white plates. Since the vegetables didn’t cook for very long (just enough to warm everything through) they kept their bright green colour. I used an entire bag of baby spinach, since it cooks down to almost nothing it is a fantastic way to get more spinach into your diet. The olive oil wasn’t over-powering, it was just enough to compliment the flavours that had cooked together. I loved how this vegetable side was multi-dimensional; the sweetness of the peas with the bitterness of the spinach and the sharpness of the leeks, well, it was just the perfect green side to serve with dinner. Thinly slice leeks and soak in cold water to remove any dirt. Heat olive oil in large stove-top pot. Sauté leeks in olive oil. Add in spinach and frozen peas. Cook until spinach has wilted (about 5 minutes). Enjoy a new favourite vegetable side! LOL. Have you considered going into sales? You made this sound irresistable!